Saline, or saltwater, often refers to seawater. On the sea, the sparkling sunlight is broken down into reflections on waves while the colour of the sea can dull just before a storm. One can never tell whether a gust of wind will bring no harm. And all of a sudden, a deafening thunder cuts through the air... The sun, the wind, the wave and the thunder all go in circles. The rampage of the subtropical monsoon climate in south China creeps into the work of this artist who grew up by the sea, giving a peculiar undertone to his work. Meanwhile, saline can be the solution that maintains the human body functioning, it is mild, gentle and dull. The artist puts himself into a mechanism like saline, observes and distills the kaleidoscope of human being. In this kaleidoscope, there are no permanent phenomena, only permanent illusion. The truth of the naked body was long lost in the strange trends of idealization and erotization. When people decide to wash off in private the dispiritedness collected throughout the day, the anger gathered by the revealing skin would dissolve into peace. But a public place to “bath” is the opposite and a challenge of privacy. The bodies are revealed to each other, the touching may arouse intimacy between strangers, or an ambiguous interpretation. Interestingly, the process of creating artwork is mostly private, while exhibiting it is like putting oneself in a “public bath”. Being private and being public are intertwined in such a way, erupting in rich connotations. Ox Warehouse invited Mainland video artist Samben to participate in a residency project in Macau. Samben’s works had been exhibited in Shenzhen, Hangzhou, Beijing, Germany and Switzerland. Born in a seaside town, Samben chose “Saline Bath” as the theme for this project. Based on his past animation videos, he tried to showcase this kind of intimate or ambiguous thoughts with elusive visuals, hoping to provide some other insights into the dilemma between common philosophical considerations and people’s actual life. 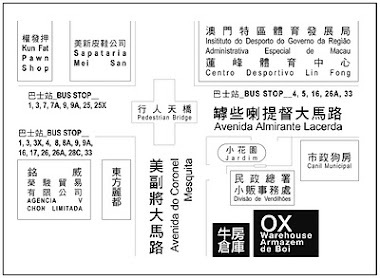 展覽地點 Exhibition Venue：後牛房實驗場（澳門和隆街十五號）Post - Ox Warehouse Experimental Site (Rua do Volong, No.15, Macau). Space Reader was formed in 2016 by a group of young creative persons in Taiwan, aimed at carrying out collective creative experiments and research projects, with different types of creators being invited for each project. The concerned creative form is a combination of installation and performance, where an installation becomes not just an object to be appreciated, but an artwork that connects with the audience and performers, as well as with their actual shared experiences from impromptu interactions. The aim is to explore the possibilities of different read/response forms in the actual space and in the creator's inner space through the lightest yet most spontaneous bodily actions. American dancer and film director Yvonne Rainer said: "No dance work is a single idea or narrative, but rather a subtle blend of diverse elements, determining the nature of the whole experience." This idea coincides with the concept of Space Reader’s projects. Each creator searches for the sketching of his/her body through space or objects. We are not dancers, but we dance in space. A performance installation or an installation performance? 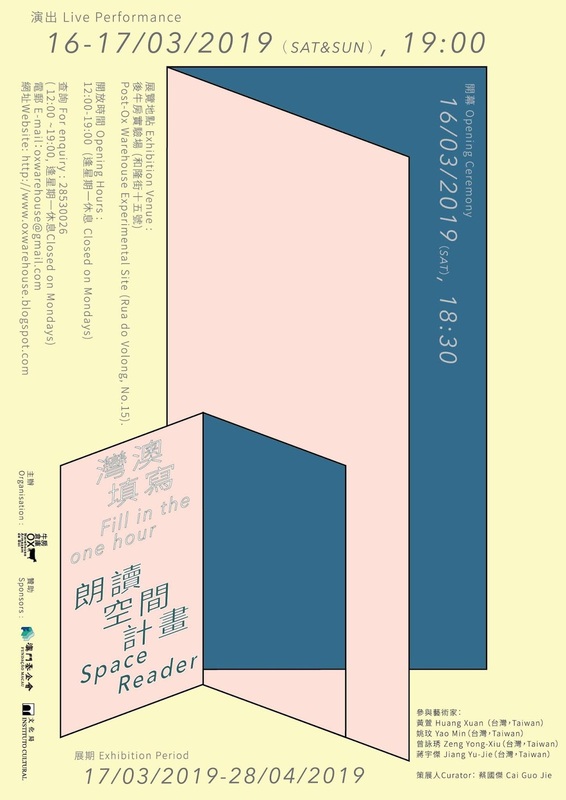 展覽地點 Exhibition Venue：後牛房實驗場（澳門和隆街十五號）Post-Ox Warehouse Experimental Site (Rua do Volong, No.15, Macau). 牛房倉庫（前稱婆仔屋藝術空間）成立於2003年3月，為澳門一非牟利民間藝術組織，主要處理牛房倉庫內之行政及節目策劃工作。策劃的展覽和演出均以本地較另類的當代藝術創作為主，以彌補本地在這方面的不足；並全力進行藝術推廣活動，開辦具啟發性的藝術工作坊，鼓勵及培養個人創意和實驗精神；策劃跨地域的深入交流計劃；並開放牛房倉庫的空間，與本地藝術工作者和團體合作使用，使牛房倉庫成為澳門藝術創作的實驗交流平台。 Founded in March 2003 in Macao, Ox Warehouse (former name: the Old Ladies'House Art Space) is a private, non-profit, art association. It manages a leased artistic venue, Ox Warehouse, with a small staff in charge of daily administration and program planning and organization chores. The Ox Warehouse presents exhibitions and performances of contemporary art, trying to provide an alternative platform to the local arts scene, which is a bit wanting in this regard. Being dedicated to the promotion of art, the Ox Warehouse also organizes inspirational artistic workshops, in order to foster individual creativity and the experimental spirit, as well as cross-border exchange programs. Last but not the least, the Ox Warehouse art space is open to local artists and art associations for collaborative projects, making the venue an experimental platform for Macao's artistic creation.